In the early morning hours of September 26, 1995, German scientific journalist and author of several popular Area 51 books Andreas von Retyi saw a strange aircraft on the ramp near Hangar 18. He had camped on Tikaboo Peak with a friend, and in the morning they noticed a B-2 bomber maneuvering in the distance. 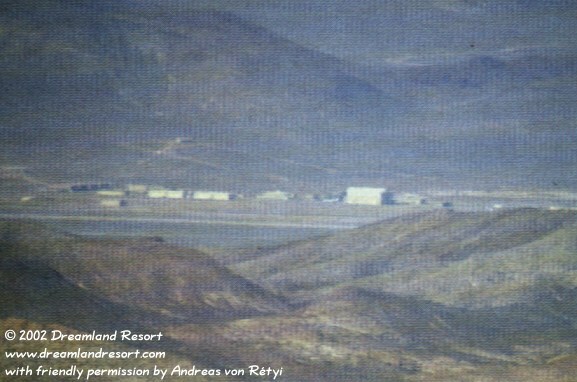 Shortly afterwards, while taking photos of Area 51 with a telephoto lens, Andreas noticed a large white plane sitting on the south ramp, next to Hangar 18. At first Andreas thought it was a Boeing 737 of the Janet airline, but when he took a closer look through the eyepiece of his 220x magnification telescope he saw that it was clearly something different. This is a draft of what he saw that morning: The front looked very pointed and angled down, like the French Concorde or the Soviet TU-144. The fuselage appeared elongated towards the back of the aircraft, with what seemed to be triangular wings and a huge tail. Andreas said it reminded him of the XB-70A "Valkyrie", a NASA Dryden experimental aircraft flying in the 1960's, although several details were different. Most notably the plane was missing the XB-70's huge air intakes, and the tail appeared elongated and much larger. When the B-2, which had disappeared out of sight for a while, reappeared and came closer, their attention briefly focused on it, and when they looked back towards H-18 the unidentified plane was gone. Shortly afterwards they heard a loud and low rumbling sound in the air, which appeared to be traveling at extremely high speed from north to south. Although they never saw a plane it is likely that this noise was somehow connected to the unknown plane that they had seen before. This is a photo of the unknown aircraft (to the left of H-18). Of course the resolution of this photo is not anywhere near as good as what Andreas saw through the eyepiece of his 220x telescope. But by comparing the plane in this photo to the known length of H-18 of 200ft. we can estimate that it has a length of about 90 to 100ft., about the size of a "Janet" Boeing 737-200. With friendly permission by Andreas von Retyi, from his excellent book Geheimbasis Area 51 (currently available only in German), in which he has documented the sighting.